Figure 1: The structure of the solar atomosphere. The sun is a star mainly made of hydrogen and helium gas, which has multiple layers in its atmosphere. The photosphere is a visible layer, radiating the white light emission, which is called the solar surface. Black spots in the photosphere are called sunspots, where the magnetic field is stronger and the temperature is lower than the surrounding area. 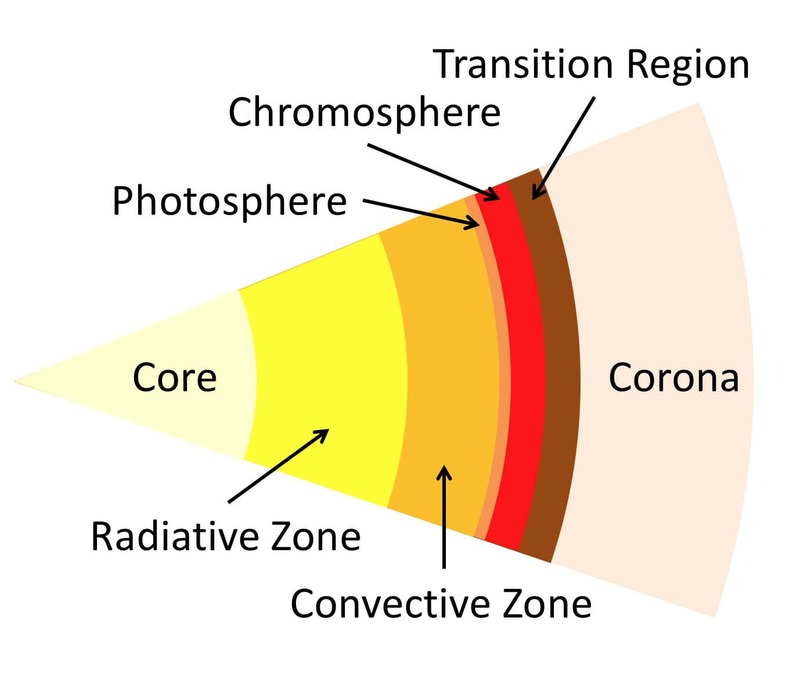 Inside the sun, there are three layers called the core, the radiation layer, and the convection layer in the order from the center. Nuclear fusion takes place at the core, emitting light and heat. Outside of the photosphere are the chromosphere, the transition region, and the corona. The chromosphere is a “red” layer observed with the emission line of hydrogen alpha. There are shadowlike dark thread structures in the chromosphere, which are called filaments. When they move to the solar lim by the corotation of the sun, they show bright loop structures in front of the dark space background, which are also called as prominences. These filaments or prominences sometimes erupt simultaneously or in association with solar flares. These eruptions sometimes arrive at the interstellar space and evolve into a coronal mass ejections (CMEs). The sun emits multi-wavelength radiation, not only visible light, but also radio, infrared, ultraviolet (UV), X-ray and gamma-ray emissions. Observations by these multi-wavelength emissions reveal the dynamic activity of the sun, which cannot be seen from the white-light emission. 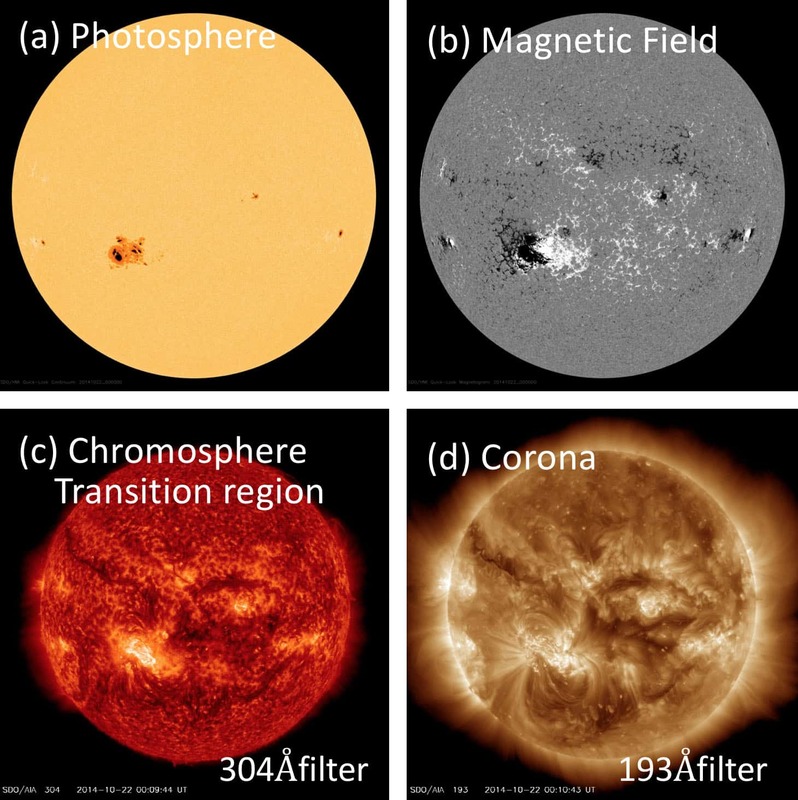 Figure 2 shows solar images observed by a satellite with four different wavelengths, : (a) the photosphere observed by the white-light emission, in which there are sunspots, (b) the photospheric magnetic field taken by polarimetric/spectroscopic observations by visible light, (c) the transition region of 5×105 K temperature plasma, observed by extreme-ultraviolet (EUV) emission (304 Å), and (d) the corona observed by EUV emission (193 Å), where active regions above the sunspots are bright. Furthermore, there are ground-based or space telescopes for imaging or spectroscopic observations with X-rays, infrared, and radio emissions. On the other hand, there are devices for monitoring the total flux of X-ray and radio emissions of the sun. For example, the level of solar flares is determined by the X-ray intensity (1-8 Å) observed by GOES, which is a weather satellite of the US. The long-period observation has been performed with radio flux with a wavelength of 10.7 cm, called F10.7 (frequency 2.8 GHz). Since there is a strong correlation between F10.7 and the sunspot number, F10.7 is also used as an indicator of solar activity. The radio emission in the frequency range of MHz-GHz sometimes rapidly increases in association with solar flares and filament eruptions, which are called solar radio bursts. Radio bursts in the MHz band are signals of the occurrence of a CME, so they are used to estimate the impact on the Earth. Figure 3: X-ray image of the sun and a solar flare near the center at 14:49UT on 2000 June 7 (Yohkoh/SXT©JAXA/ISAS). 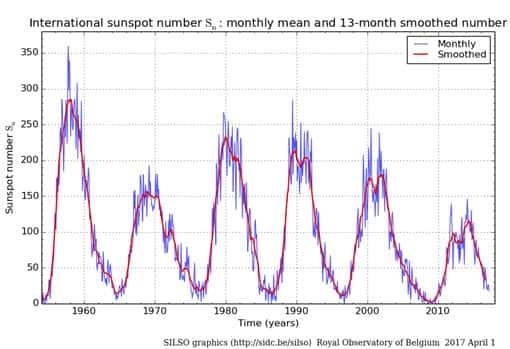 Figure 4: 11 years solar cycle reflected by number of sunspots (cited from web page of SIDC, Royal Observatory of Belgium). A sudden brightening around sunspots at X-ray, EUV, and optical wavelengths is called a solar flare (Fig. 3). Solar flares are the largest eruptions in the solar system, and they release ionized gas and plasma from the solar atmosphere, harmful high-energy particles, and a large amount of X-rays. The typical size of a solar flare is 10-100 Mm and the typical energy is comparable to 10(5-8) hydrogen bombs. However, the fundamental mechanism of solar flares has not been revealed despite their discover more than 100 years ago. Solar flares usually occur at and around sunspots with a strong magnetic field, where stored magnetic energy, such as magnetically sheared energy, is released. It is known that sunspots with complex structures produce a larger class of flares more easily. Solar activity varies between active and quiet periods with a period of 11 years (Fig. 4). The number of sunspots also undergoes a similar variation every 11 years. When there are many sunspots, the solar activity is high, and in general, more flares occur. Inversely, when there are no sunspots, no flares occur. This is why the number of sunspots is used as an indicator of solar activity. Figure 5: Coronal mass ejection taken by the coronagraph of LASCO C2 on board SOHO at 10:57 UT on 2002 January 4 (LASCO/SOHO © ESA/NASA). Huge amounts of ionized gas and plasma from the solar atmosphere sometimes erupt into interstellar space and are associated with solar flares. This phenomenon is called coronal mass ejection (CME), whose speed is 100–1000 km/s and total mass is estimated as a few times 10 billion kilogram to more than 10 billion ton. 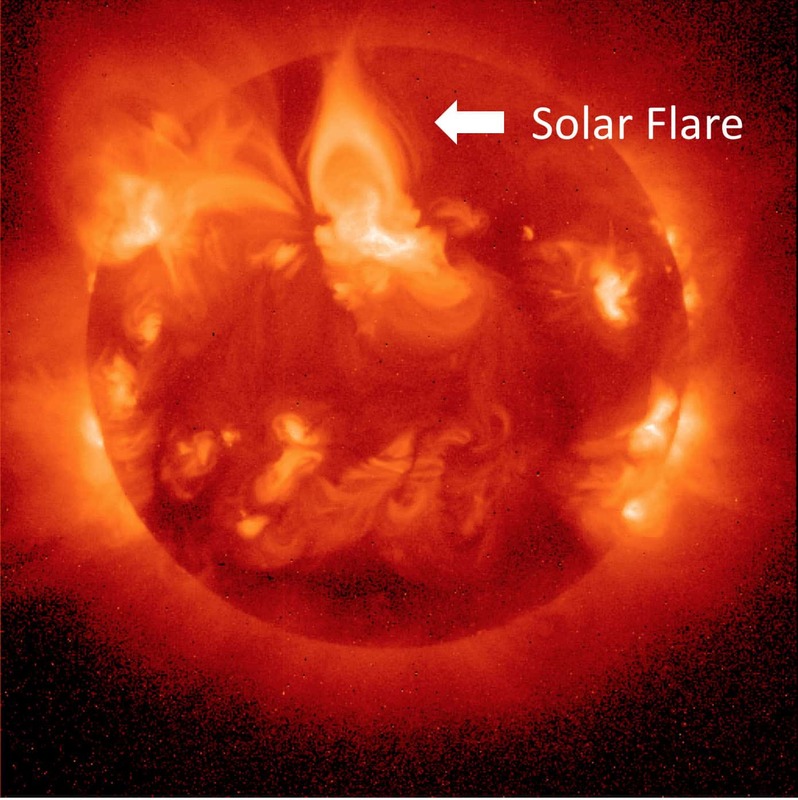 CMEs without solar flares are also observed in rare cases. The speed of CMEs is sometimes larger than the sound speed, causing a shock to be formed at the propagation front. 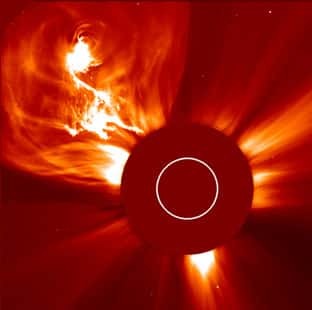 Some CMEs consist of a magnetic flux rope, which is considered to be ejected from the corona following the shock front. This magnetic flux rope has a cylindrical structure. When the magnetic field is directed toward the south, large-amplitude geomagnetic storms occur. 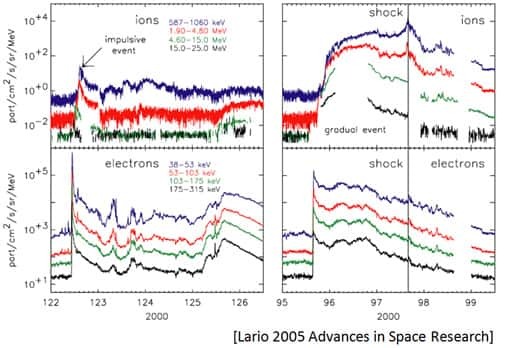 Figure 6: Two typical solar energetic particle events [Lario et al. 2005, Advances in Space Research). Solar flares release not only a large amount of radiation but also high-energy particles, called solar energetic particles (SEPs), such as electrons, protons, and heavy ions in the energy range of MeV – GeV. Some particles propagate with a speed of 20–30% of the light speed, and they arrive on Earth only 30 min after the occurrence of a solar flare. These particles are not only electrons but also heavy ions, e.g., He, Fe, and O, and they are observed with a duration of a few hours to 1 day. In another typical case, high-energy protons are observed when the CME arrives at Earth; afterward, the number of protons gradually decreases within a few days. SEPs can affect human space activities around Earth. Very high energy particles from the sun are sometimes observed using a cosmic-ray monitor on the ground. Within the solar cycle of 11 years, 10 events occur on average at around the solar maximum activity. 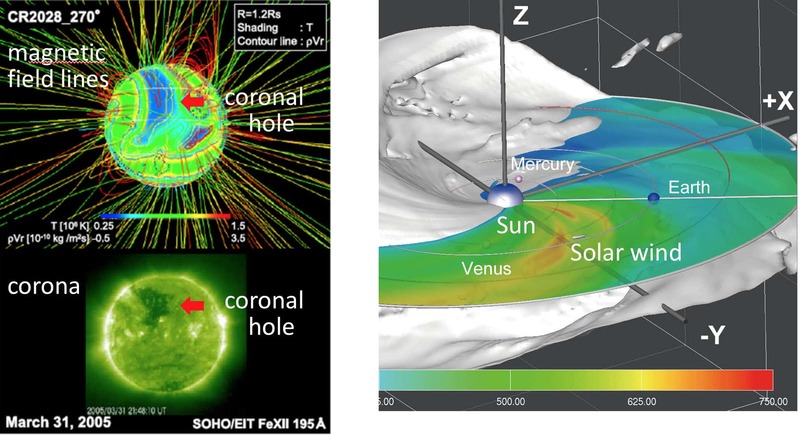 Figure 7: Open magnetic field lines in the solar corona calculated by numerical simulation (above), and coronal images with coronal holes taken by the EIT telescope on board SOHO (below) [Nakamizo et al. 2009 JGR]. Numerical simulation of solar wind from the sun to Earth (right) [Shiota & Kataoka 2016]. Coronal gas continuously flows out to interstellar space. This stream is called solar wind, which is accelerated to a supersonic speed. In the solar atmosphere, closed magnetic field lines and open field lines are observed, and solar wind is considered to flow along the open field lines. The origin of solar wind is located at coronal holes, where high-speed plasma flow is continuously observed and it makes the region dark. Since the sun and the solar wind corotate with a 27-day period, the solar wind produces a spiral structure with the center at the sun. Solar wind is measured by in situ observations of plasma density and velocity, just 1 hour before its arrival on Earth, by ACE and DSCOVR satellites. Solar wind with a speed of ~300 km/s is called slow solar wind, while that with a speed of ~700 km/s is called fast solar wind. The latter can propagate from the sun to Earth within ~2 days. The fast solar wind flows out from the coronal holes at lower altitudes, and it is often observed with a period of 27 days, synchronized with the solar rotation.